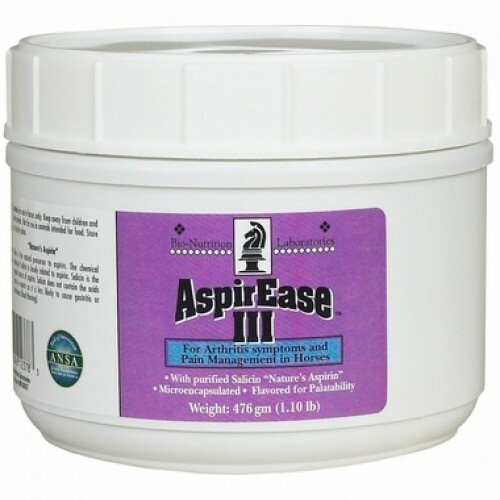 AspirEase III with salicin, “nature’s aspirin”, is an aid to pain management in horses. The chemical makeup of salicin is closely related to aspirin; it does not contain the acids found in aspirin, so it is less likely to cause gastritis or thrombosis (blood thinning). Flavored for palatability. 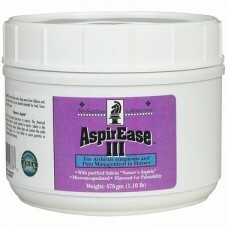 Paste: Give 20 cc orally for adult horses once or twice daily as needed at feeding time. Powder: Give one level scoop for adult horses once or twice daily as needed at feeding time. Contains salicin, the natural precursor to aspirin.